In February 2006 the first archaeology dig at the York Town historic site was undertaken.The group leader was Ph. D. Student Adrienne Ellis, Karina Acton was the Conservator, Cathy Carigiet the Artist with 15 others making up the team from the La Trobe University. The group camped out for a month on what we fondly call the Paterson Block. Three sites were chosen for excavation. The home of storekeeper Alexander Riley, Sophia his wife and their children. The second site was what is believed to be the residence of Lieutenant Colonel William Paterson and his wife Elizabeth and the third that of an unknown soldier and his family. Excitement rose amongst our members, as the month grew nearer. I suspect some romancing the notion they would be whiling away summer days brushing a bit of dirt here and there, in the hope that they would unearth the treasure that would reveal all about the tiny settlement. This of course soon proved not to be the case. Little did we know that this arch, lark, would be hot, back breaking, dirty and dusty, not to mention the bugs, spiders, ants, ticks, sand flies and march flies. I for one did not realize what a learning curve I would be on. We had joked about how we would sit at the excavation sites with our little brushes cleaning the artifacts we all hoped we would find. While these thoughts were partly correct we soon learnt there was much more. We had not reckoned on the tons of dirt that had to be removed, sieved, on some occasions twice, then at the end of the four weeks returned from whence it came. Then there was the terminology to reckon with, trench (the area under excavation) context, (the different levels of soil as the excavation proceeds) to name but two and contrary to what we may have believed we were not just digging holes, the sites were meticulously swept, measured, photographed, charted and then extensive notes were written at every context of which there were many. The month was a very busy one for all on site. Our president John Dent lost kilos taking guided walks, media groups and the much appreciated afternoon chocolate treat around the site. Margaret and John McKenzie were on permanent kitchen duty and in her free time Margaret recorded notes in the daily diary, which are now being used for this “Historian”. Richard Hooper was our fix it and fetch it man, as usual executing the job brilliantly. Alma and Philip Ranson were resident mum and dad, working with the team and keeping a concerned and watchful eye on all. We are very thankful for the assistance we received from the local business people and the West Tamar Council. We would also like to thank the little York Town community for their support. To those members of our society who worked so long and hard well done. I am sure none of us would have missed a minute of it. During February we were able to witness the construction of the car park and paths followed a few week later by the erection of the signs. 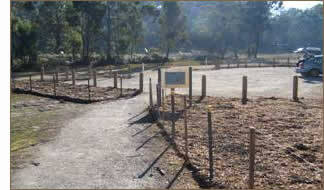 The area around the car park has been planted with native plants and the barrier fence around the monument site will soon be completed. The toilet has now been erected and soon Bowen’s Road from Greens Beach Road to Charles Street, York Town will be sealed.